itsAlyx: Honey. Why I Wash My Face with the Stuff. Hola! That was for all you Spanish speakers out there. Sorry I didn't have the upside-down exclamation point. A couple of days ago, I did a post full of randomness, and what the majority of people took away from that was this little factoid: I wash my face with honey. Yep, it's true. Every day now, going on about a week and a half. You know what has happened in that time? 1. My face has not gotten a single new pimple.2. The pimples that were all over my forehead are almost completely gone. 3. My skin is no longer super dry.4. The scar in between my eyebrows (waxing your own eyebrows [or attempting to] is not recommended, folks) has faded. I wish I could say it's completely gone, but as you can see from the photo above... it's still there. 5. My old acne scars have faded. That's right, all of that happened because of honey. I use an organic honey, because it's available for a reasonable price here. I would recommend organic or raw honey if you can get it for a decent price, because it isn't as processed. If, however, all you can get is your standard, run-of-the-mill honey, use that! It should work fine. Keep in mind, though, that this is your new face cleanser. That should make you feel a little more okay with spending $5 or $10 on a bottle of the stuff. Let me tell you a little about my nightly honey regimen (no, Hubby does not lick it off of my body - get your mind out of the gutter). Remove all makeup from your skin!! 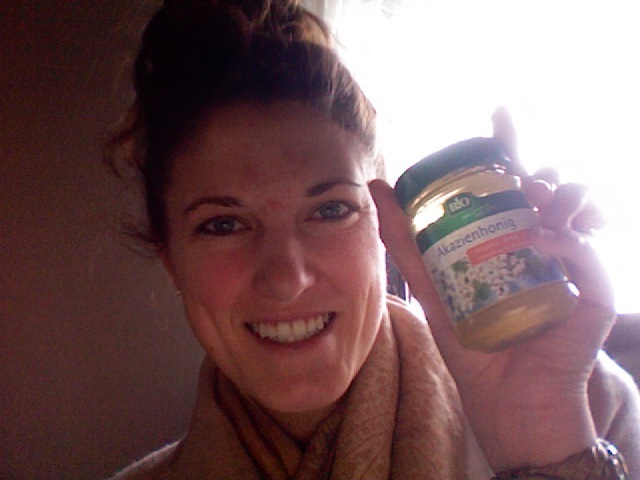 Honey is great, but it will not wash your makeup off. 4x a week, I mix a spoonful of honey with a half spoonful of baking soda.I take that and rub it onto my face using circular motions. I rinse with warm water (it comes right off).Pat dry. 3x a week, I use a spoonful of honey.I rub the honey onto my face using circular motions.I let it sit for about 2 minutes.I rinse with warm water.Pat dry. PS Please vote for my photo here. Just leave a comment saying you like my photo. I'm losing for some reason, and the super competitive person in me HATES losing. So... go vote! Please?? Also... don't forget about my giveaway here. i am so trying this!!!!!!!! I need to try this.... thanks! Love this! Will definitely have to try it. that's so incredible!! might just have to try this sometime very soon! love! Oh my gosh! Maybe I should try this! Haha. Thanks for the idea! I am so trying this... I have struggled with acne for 23 years and am sick of it. I hope honey works! It definitely looks as though it will! I'm definitely going to have to try it! Honey sounds so soothing and amazing. Wow!! I am definitely trying this out!! This is such a great idea! I'm glad it worked for you. Honey is awesome. 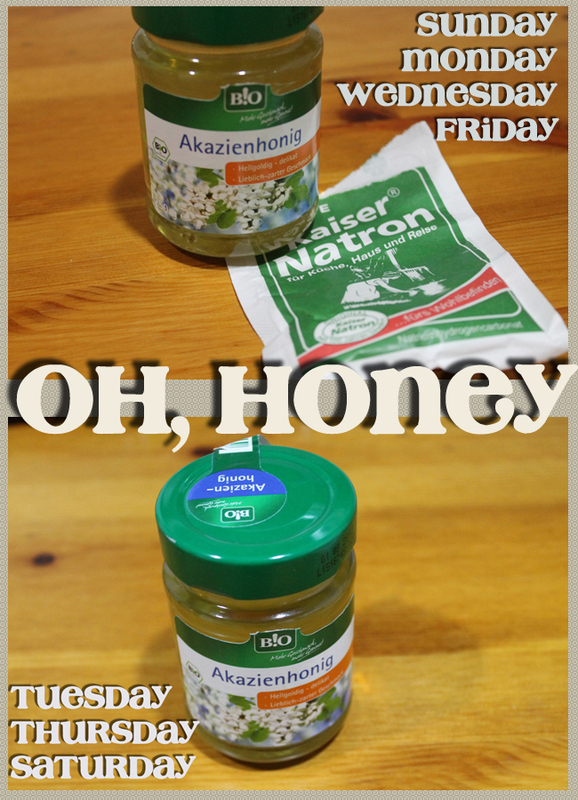 If you take a teaspoon (or maybe tablespoon, I don't remember) of local honey once a day it'll help a LOT with allergies. 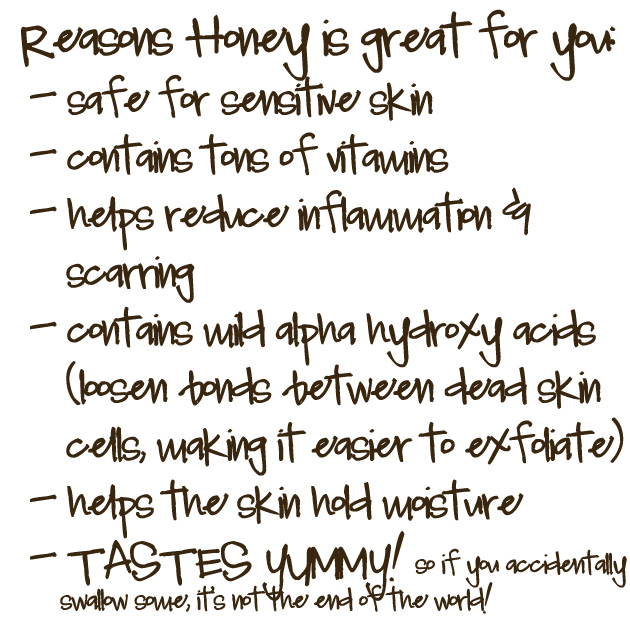 Honey sounds like a great face wash :) I haven't tried it, but I would surely get it in my hair. Like I can nearly guarantee it. I tried this this morning and it was great!!! I was skeptical about it washing off easily but you were right- easy as! This sounds awesome! I'm seriously going to try it. I've been using baking soda as my exfoliator and I love it. I break out a lot/have acne scarring and none of the face wash brands have done anything to help. What do you use after- do you use anything with salicylic acid? What kind of face lotion works best for you? i love honey. it's good and good for you! i just hope that bees don't become extinct any time soon! def trying this! who wouldve thought! ?